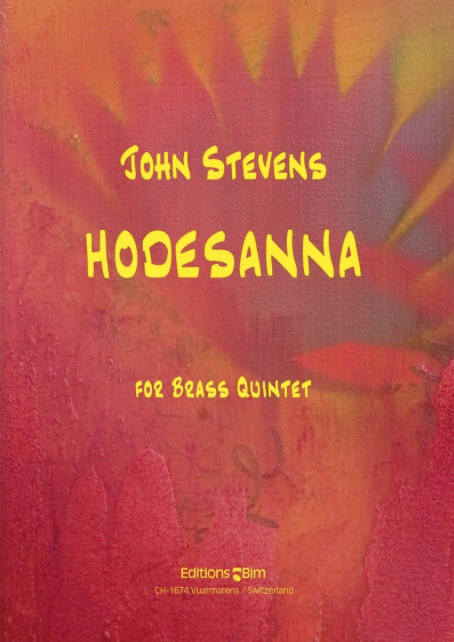 Hodesanna is a new five movement composition for brass quintet with the tuba player as soloist. The composer is John Stevens, who from 1985-2014 was a faculty member at the University of Wisconsin Madison School of Music, where he was Professor of tuba/euphonium, a member of the Wisconsin Brass Quintet, and Director of the School of Music. Hodesanna is an outstanding tuba solo with quintet. Not only does the solo part explore a multitude of styles, it also showcases the lyrical and technical side of the instrument and the extreme ranges that it is capable of producing. The first movement, Bop, opens with an extended cadenza and continues with the tuba providing the melodic line and the other instruments adding the requisite hits and backgrounds. The second movement, Waltz, opens and closes with a first trumpet solo while the middle section once again features the tuba in a quick waltz in one to the bar. The third movement, Tango, features the most technically challenging tuba passages, which are quite virtuosic. Fast 16th note passages abound with range up to g-flat1. The fourth movement, Elegy, is my personal favorite. All four accompanying instruments are muted with trumpets and trombone in cup mute. The result is a warm and poignant sound to support the lush tuba melody. After opening with trumpet one solo, the tuba part soars through the staff and just above, emoting in its most beautiful range. The last movement, Blues, extends the tuba range up to e-flat2 and a final cadenza brings the piece to its conclusion. All four accompaniment parts require mute but otherwise are of a technical and range level for college performers. Parts are clearly notated on quality paper. Trumpet parts are in C.
John Stevens has been a well-known and respected composer for many years. This piece adds to his legacy and reputation. It is a beautiful and moving ode to his former student and is highly recommended for any quintet with proficient tubist.